Located in Northern North America, Canada has a 8,893.00 km border with US (includes 2,477 km with Alaska). It has a 202,080.00 km coastline. Canada and the United States dispute how the Beaufort Sea should be divided. In addition, the soveriegnty of Hans Island in the Arctic Ocean is disputed with Denmark. The capital city of Canada is Ottawa, which is located in the east-central province of Ontario. The population of Ottawa is just under one million people, although more than one milion people live in the metropolitan area. Ottawa has been the capital city of Canada since 1857, and is today consistently ranked as one of the best places for quality of life to live in Canada as well as the world. The climate of Ottawa is humid continental, which includes four distinct seasons with warm summers and very cold winters. Ottawa is a popular destination for tourists, particularly because of its world-renowned museums. 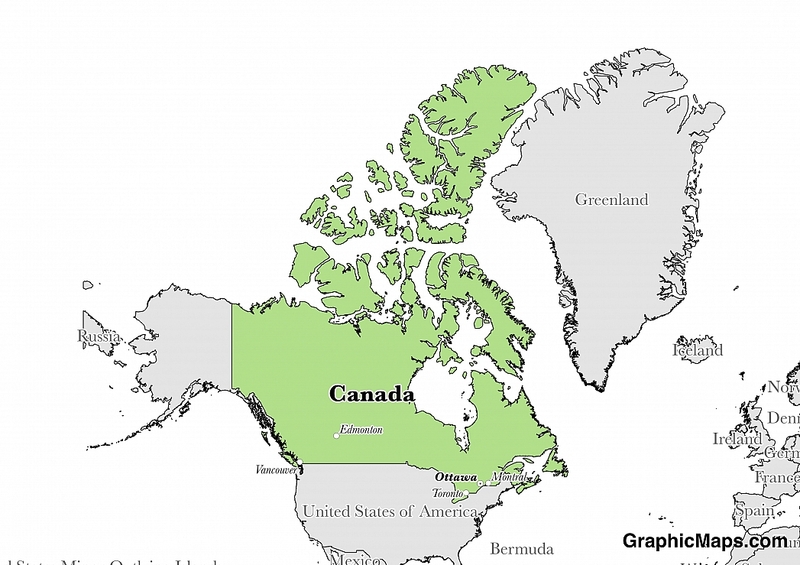 Canada is a North American country covering 9,984,670.00 km2 of which 8.93% is water and 9,093,507.00 km2 is land. This makes it the 2nd largest country in the world and slightly larger than the US. Its geographic coordinates are 60 00 N, 95 00 W and Ottawa is the capital city. The name "Canada" comes from the St. Lawrence Iroquoian word "kanata" meaning "village" or "settlement". Its ISO code is CA. Canada has a mean elevation of 487 m above sea level. It has a varied climate, from temperate in the southern part of the country to subarctic and arctic in the north. Its terrain consists mostly of plains with mountains in the west and lowlands in the southeast. Canada has a population of 35,362,905 making it the 38th largest in the world. The country's population mostly lives within 300 km of the border with the United States. English and French are official languages. The majority ethnic groups reported are Canadian, English, French, Scottish, and Irish. The population is mostly Roman Catholic or Protestant, although a large number identify with being non-religious. The official languages of Canada are English and French, though a great number of unofficial languages are also spoken. The Official Languages Act of 1969 protects the rights of Canadians to use English or French at the federal level. Among these minority languages are several Indigenous languages that are unique to Canada, although many of such languages are endangered. There are several phrases in Canadian English that are unique to the country, and Quebec French is a variety of French that is completely unique to the province of Quebec, which phrases that are not used in spoken French elsewhere and phrases which take on different meanings within Quebec. There are at least five variations of sign languages being used in Canada. Canada is an independent country. It became a country in 1867. Its constitution was last ratified in 1867. The Government of Canada, officially Her Majesty's Government, is both a federal parliamentary democracy as well as a constitutional monarchy. The current Prime Minister is Justin Trudeau, who has served since 2015. He is the 23rd Prime Minister of Canada. The House of Parliament in Canada is Parliament Hill in Ottawa. The Official Residence of the Prime Minister is 24 Sussex Drive in Ottawa. There is no maximum term that Prime Ministers of Canada can serve. Factoring in Purchasing Power Parity, Canada's GDP is $1,670,000,000,000.00 (USD) with $46,200.00 (USD) per capita. This makes it the 17th largest economy and its citizens the 33rd richest in the world. The currency of Canada is the Dollar (CAD). Its major export partner is the United States. Its main exports are motor vehicles and parts, industrial machinery, aircraft, and chemicals. Its major import partners are the United States, China, and Mexico. Its major imports include machinery and equipment, motor vehicles and parts, and crude oil. The Canadian flag consists of two red blocks on the side, and one white block in the center. The red stripes combine to be the same size as the white stripe. In the center of the flag is a maple leaf. Although the maple leaf has officially been a symbol of Canada since the 18th century, the current Canadian flag was not adopted until February 15, 1965. The official name of the flag is the "flag of Canada" or the "Canadian Flag", although the colloquial "Maple Leaf" is also used. In French, the flag is called l'Unifolié (the "one-leafed").